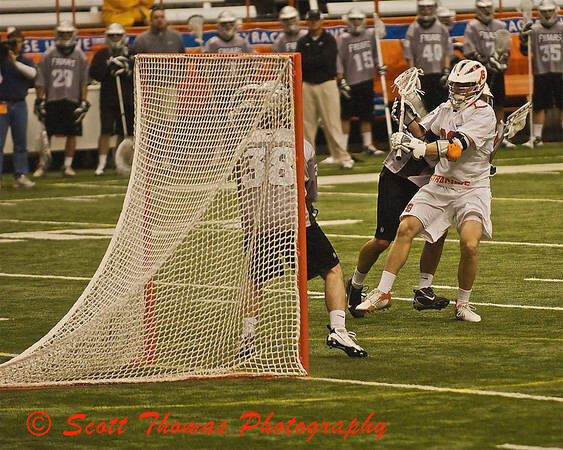 Greg Niewieroski of the Syracuse University Orange Mens Lacrosse team get ready to score a goal against Providence. Syracuse went on to post a win by the score of 22-3. The Syracuse University Orange Men’s defending NCAA National Champion Lacrosse team made it look easy today by defeating the visiting Providence Friars by a score of 22-3. Thanks to the Carrier Dome, the game was held in climate controlled comfort with outside temperatures dipping into the teens (degree F) wind chill. This concludes my Sports Weekend trifecta of three major events held in Syracuse, New York. From hockey to basketball to lacrosse, it was a fun weekend of photography. This entry was posted in Sports and tagged carrier dome, friars, lacrosse, ncaa, new york, orange, Photography, providence, syracuse university. Bookmark the permalink.